I love getting the opportunity to read French comics in English translation. I always feel like I'm missing out on a wide world of terrific comics, and so trust that the translation process works in a curatorial way, ensuring that only the best books make it to our shores. 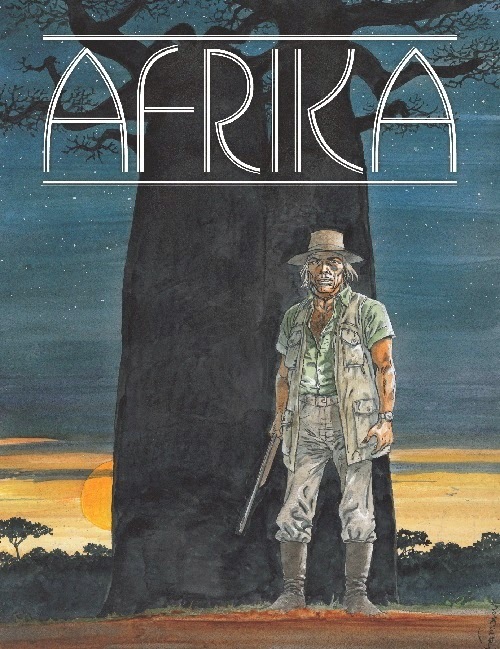 Afrika is a handsome hardcover book published by Dark Horse, and it stars Dario Ferrer, a Frenchman who is living on a nature preserve in an unnamed African country. He spends his days trying to save the animals of the park from poachers, and generally just being surly and unfriendly. A French journalist arrives at the park hoping to interview him and write about the poaching problem. He's none to happy to see her, but eventually takes her out to see a recently killed animal. Later, they end up in a firefight with some poachers, and it's established that Ferrer has had some military training. Later still, Ferrer and the reporter witness the scene of a government-run attack on a rebel village, and the secrets they learn force them to leave the country immediately, and by foot. This is a quick read, with some nicely tense scenes. The cartoonist, Hermann, never wastes much time in establishing the bigger picture, so we have to trust Ferrer's interpretation of events. There is a subplot involving Ferrer's African girlfriend and another European who is always around, but it doesn't go all that far towards adding much to the story.